Everyone else seems to review stuff so I guess I'll jump in too! As war-gamers we (many of us!) surround ourselves with books related to our little plastic/metal/resin men. Forge world books are my main vice - they do look pretty when all lined up! 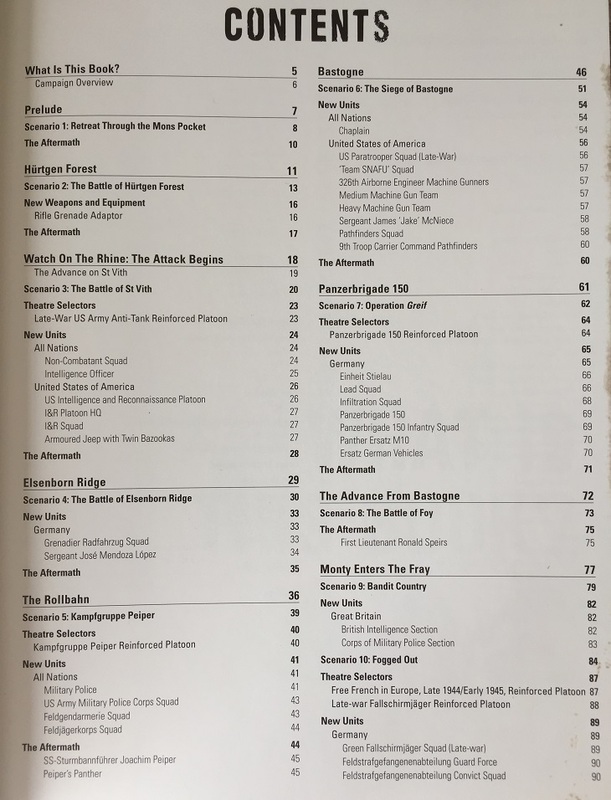 Over the weeks and months of this blog I want to take a look at various campaign/rule books, from new releases from FW right through to ancient tomes like the Angels of Death Codex - more on that another time. 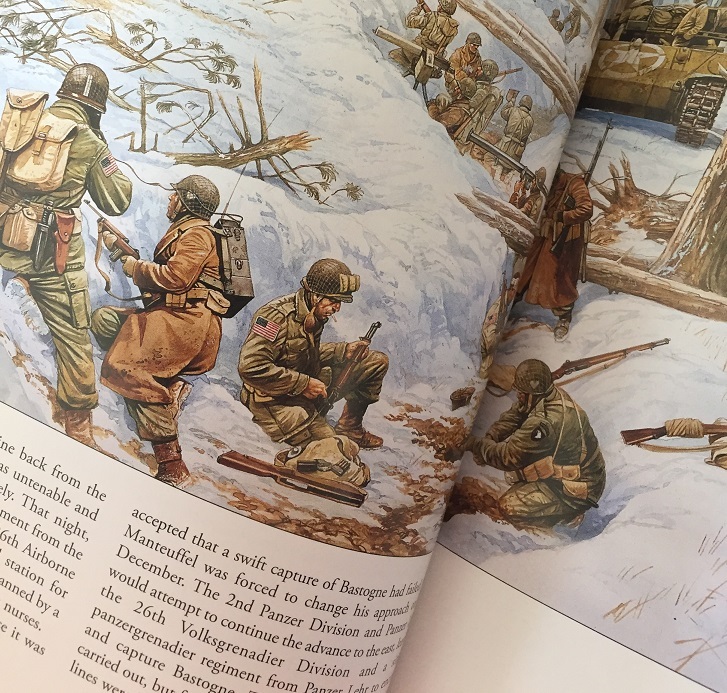 Today I wanted to take a look through the 2017 Campaign book: Battle of the Bulge for Warlord Games' Bolt Action rule set. The cover, as with several of the books released by Warlord/Osprey, has a mat finish with gloss characters. As expected it comes across as finished, designed and gives the impression of a really professional product! The inside is FULL of fantastic pictures of Bolt Action miniatures in nicely finished terrain. The sand bags, the trees, the snow; it all makes me want to make some Bolt Action Battle of the Bulge terrain (cough!). Those who own previous Bolt Action publications will be used to the other style of image found scattered throughout; the Osprey drawings. These give a great sense of the conflict they describe and are a nice contrast to the miniatures for BA. Of course the real reason we buy these books is for the rules, scenarios and the new unit entries! The Battle of the Bulge gives each of these in good measure. The narrative and their associated scenarios give a good overview of the historical details of the conflict including the initial setup right through to what would be one of the largest, and possibly most gruelling, battles for the US forces. 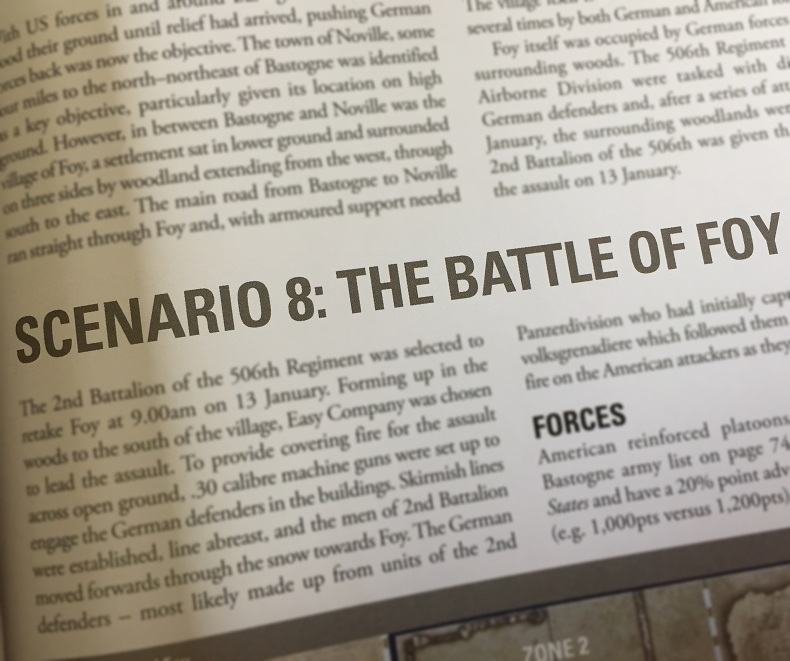 There are 12 scenarios, from the early stages including the fleeing German forces are nicely covered with rules for ambush missions and art-stealing trucks, right through to the Colmar pocket. The French/Belgian forces take a significant role in this book and to me, as someone who mainly wanted this for the 101st Airborne side of the conflict, was a nice surprise. The Bastogne section is one of the sections which will get the most love I imagine. The Band of Brothers episodes which cover this stage of the conflict are some of the most popular and the emotional interviews with those that served there still resonate with us. The description of the conflict around Bastogne covers the 'feeling' of the conflict well, and the scenarios around this stage of the battle are thematic and flavoursome. Foy; this assault is a famous scene and stars one of my favourite characters in the history of the 101st - Spiers. The stories that surround this man are open to discussion, but they help convey some of the legendary moments of this particular theatre. The story of Spiers taking over Easy and leading them on having been stalled in the open is one thing, but running through German occupied Foy and then running back must have been genuinely unbelievable to those that saw it. It would be easy to make his rules cheesy or to have them unbalance the game, but the guys at Warlord have made an interesting character. He counts as a Captain to represent the remarkable leadership he was known to show, and he conveys two special rules. One allows a nearby unit to remove a pin marker when activated, very useful to keep units in the fight, the other allows a 4+ save when Spiers is removed as a casualty - if he passes he doesn't die but continues the fight!! Foy isn't just about Spiers; it has a host of other special rules attached which I will review at the end. Spiers is also not the only special character. The Germans have several, including SS-Sturmbannfuhrer Joachim Peiper who is of course represented by the direct order model which comes with the book if purchased from Warlord directly. He has some nice, subtle rules and also has access to a Panther...(Der H: Handro! build your Panthers!). Others included are Sgt Jose Lopez and Sgt McNiece. There are also a number of rules for extra HQ choices which took my fancy - one is the chaplain. I'd associated the chaplains with actions in Northern Europe - again the visuals from BoB of the priest performing the last rights on the wounded in Carentan stick in my head! They aren't really for combat but will allow a similar pin removal mechanic to Spiers - a nice touch in this game. The other I immediately liked was the intelligence officer - an HQ unit upgrade (attached to an HQ unit) which allows, on a successful role, the choice of a dice from the bag at the start. This could be open to some cheesy lists if coupled with Spiers and a chaplain but then again, going first isn't necessarily better, and once you go it's then one less dice in the bag - good mechanic Warlord! Other units to catch my eye were the Feldgendarmerie, US military Police, non-combatants and the Ersatz units. The latter have some nice articles on Warlord here and here. - Rifle Grenades - a nice little addition to add some nice cinematic moments to your games, especially for infantry heavy lists. - Mud - this includes a mud table with effects for vehicles and artillery - don't get buried deep! - Frostbite - pre-game casualties (brutal) and a further modifier with cold weather clothing. This is a great book. Mark, Alessio and Paul should all be very proud. If this stage of the war interests you - BUY IT!